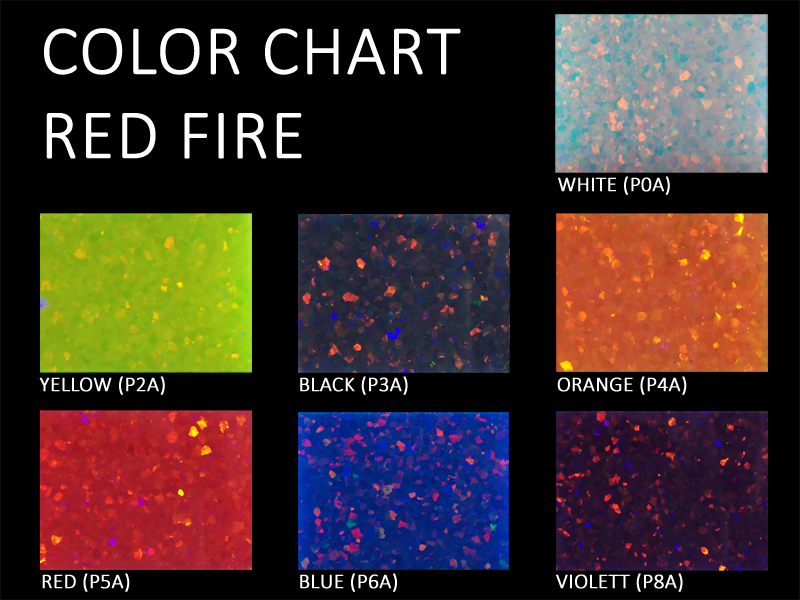 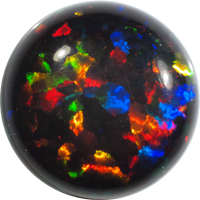 Black Opal, White Opal, Crystal Opal and Fire Opal with a Brillant Play-of-Color. 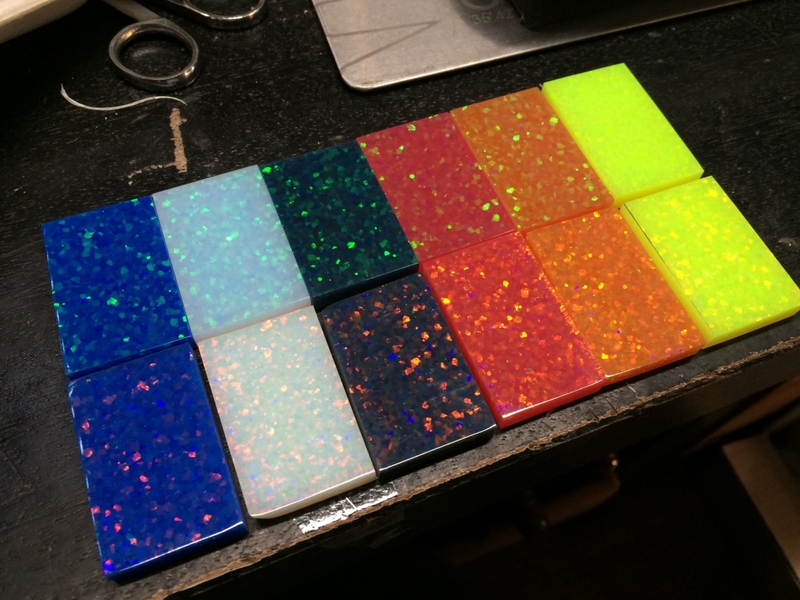 Different Types of Synthetic Opals with Different Properties. 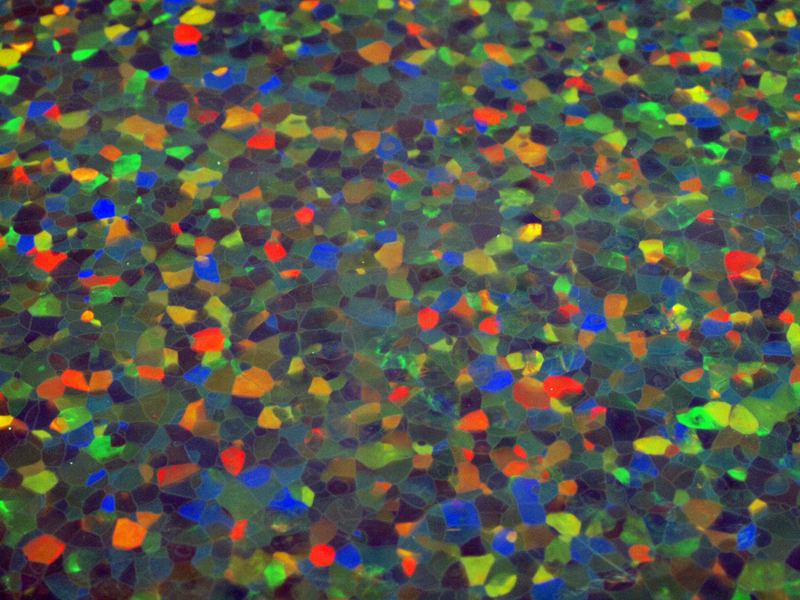 Based on research and various space experiments performed under microgravity, these opals are the world's first samples of homogeneously crystallized synthetic opals, also known as colloidal or photonic crystals. 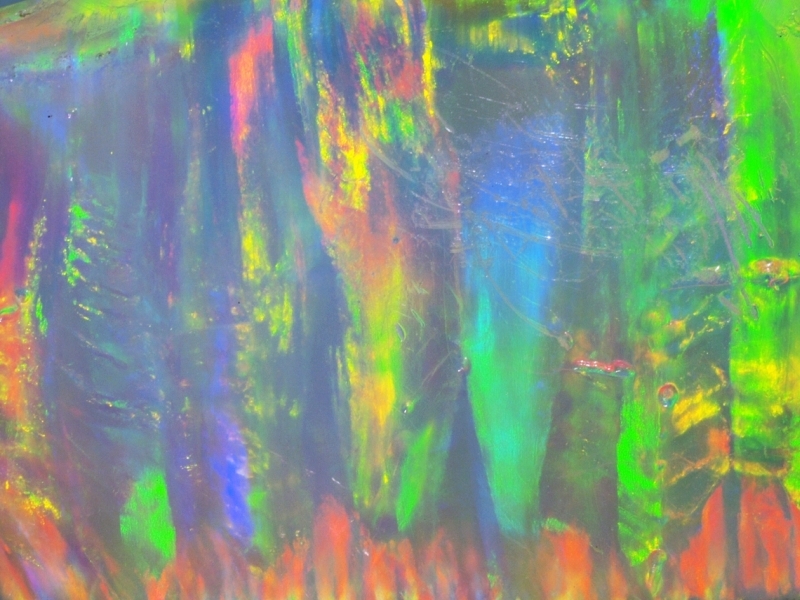 This kind of synthetic impregnated opals shows an intense play-of-color with an irregular, non-directional and polygonal pattern like natural opals, but without any cracks, inclusions or host rock (matrix). 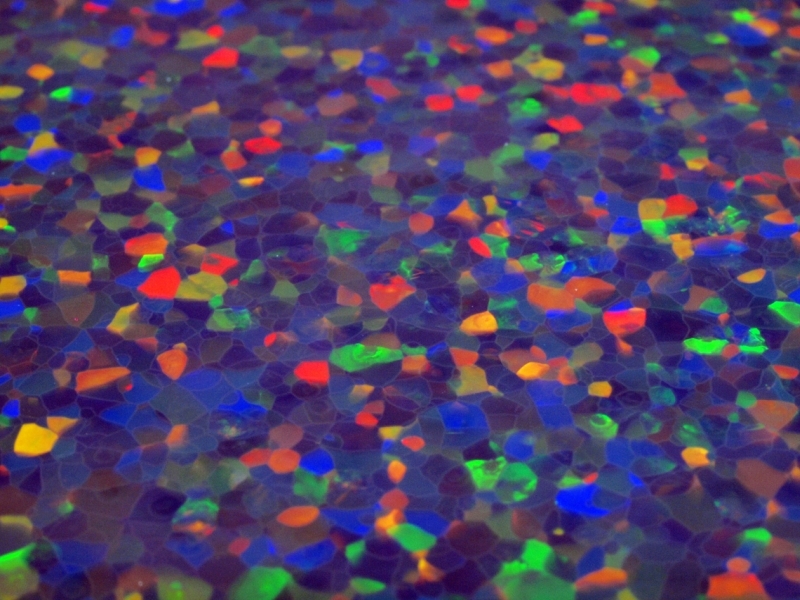 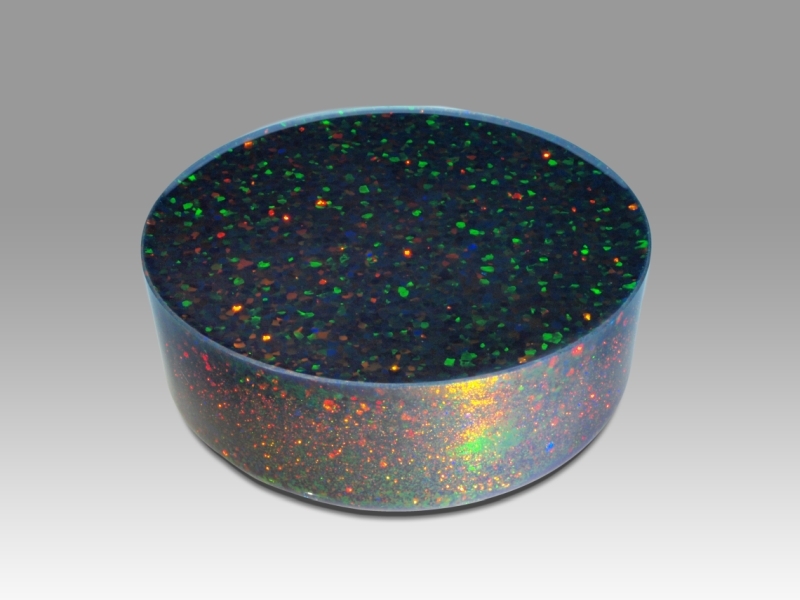 The opals are composed of self-organized and ordered monodisperse silica particles embedded in an organic polymer matrix and due to the lack of water in its chemical composition they are not prone to cracking or crazing. 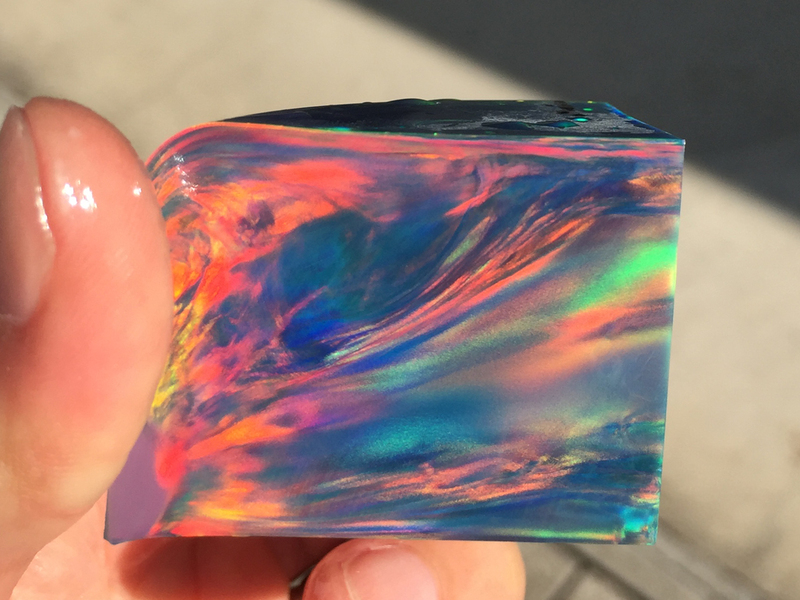 Seven varieties of synthetic impregnated opals in different body tones and with a beautiful, sparkling and vivid play-of-color are available: White Opal, Black Opal, Yellow Opal, Orange Opal, Blue, Purple and Green Opal. 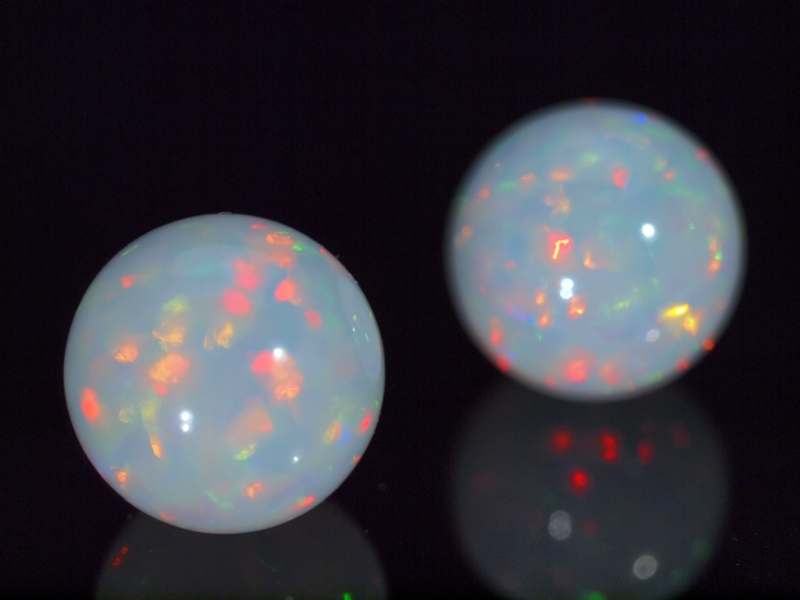 These synthetic impregnated opals don't show a columnar pattern typical for opals grown by sedimentation. 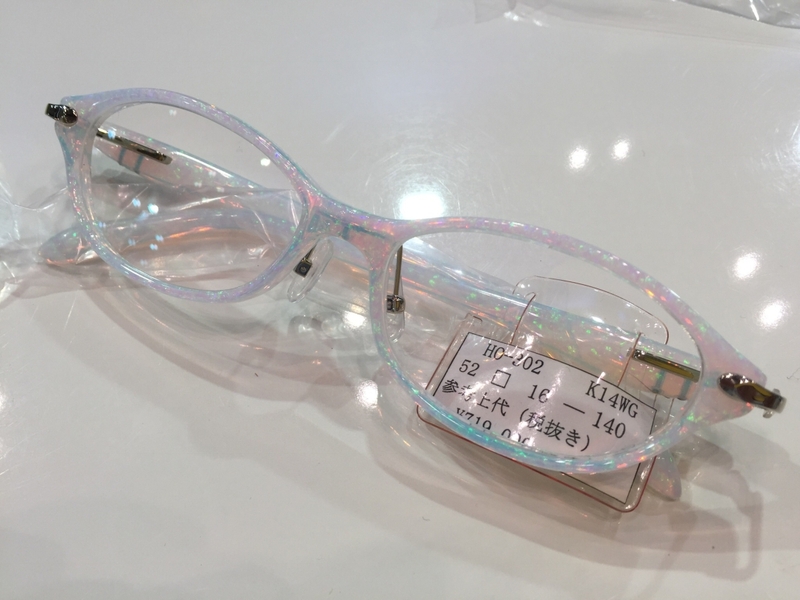 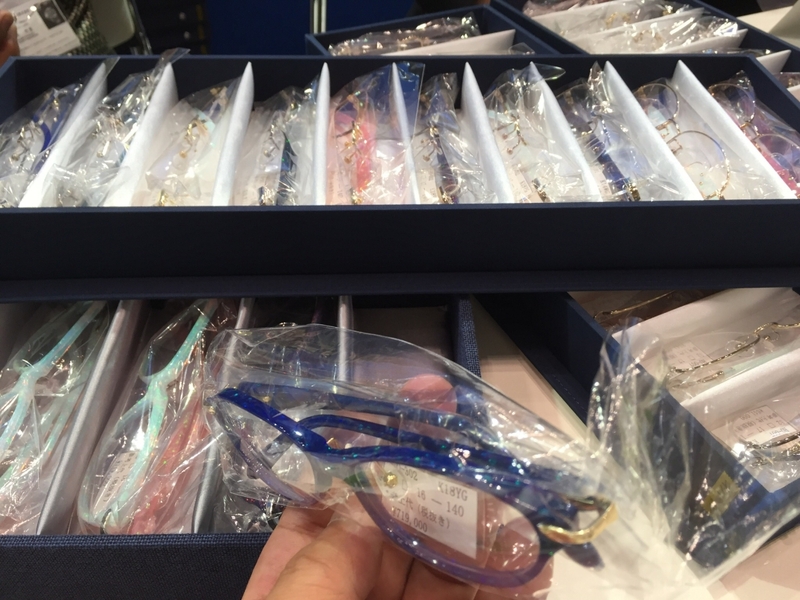 Thus, an orientation of the opals prior cutting is not necessary anymore. 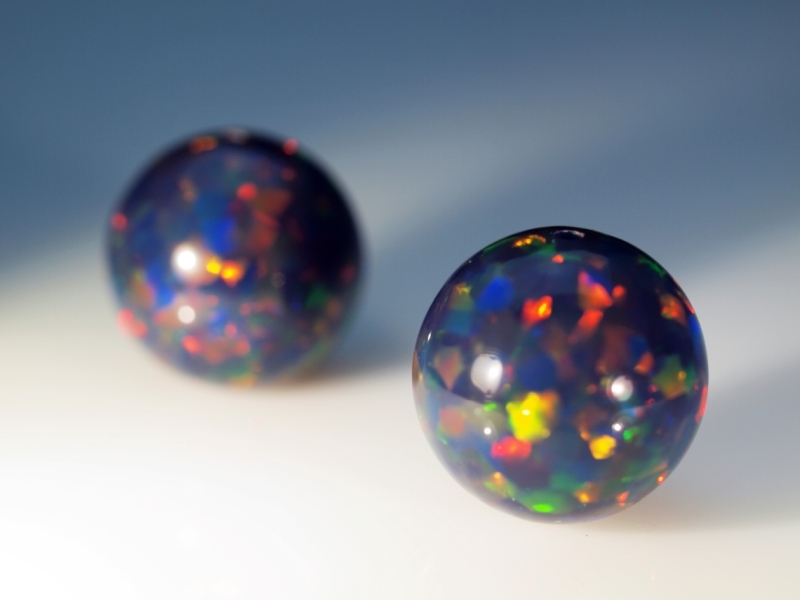 The non-directional and coarse-grained pattern with big crystallites of 2-3 mm make the synthetic impregnated opals an ideal material to cut colorful beads, teardrops and cabochons for jewelry. 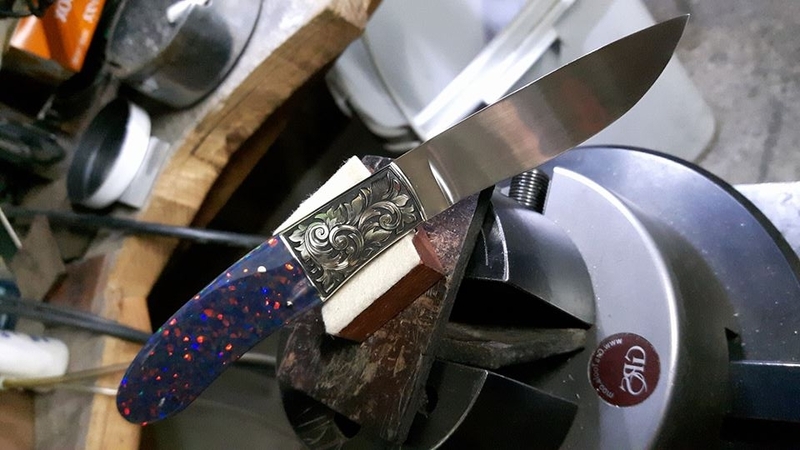 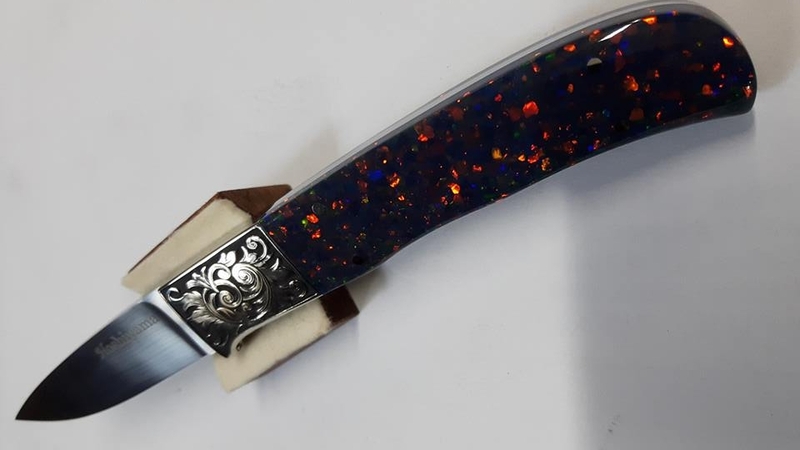 But of course, the opals can be used also as inlays for musical instruments and furniture, as mosaic tiles or handle material for knives, brushes and other exclusive objects. 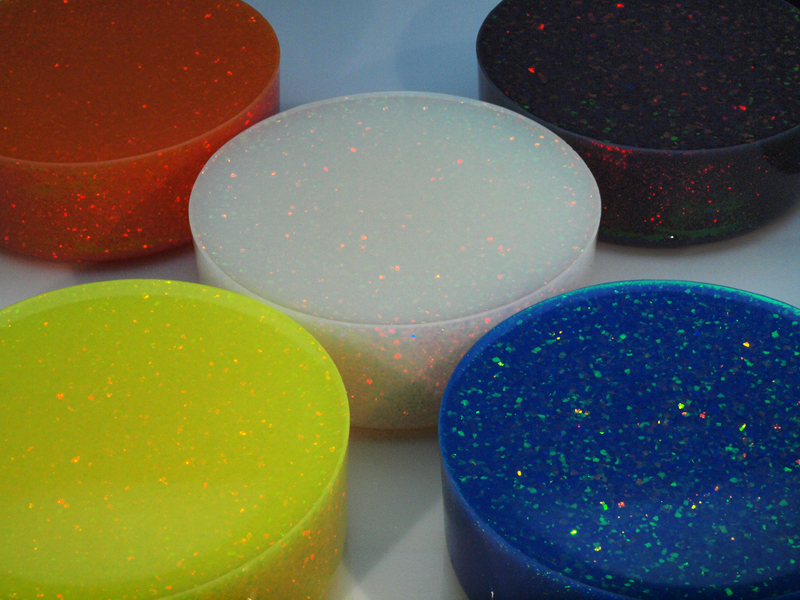 Due to the flexibility of the opals in thin sheets also curved surfaces can be decorated. 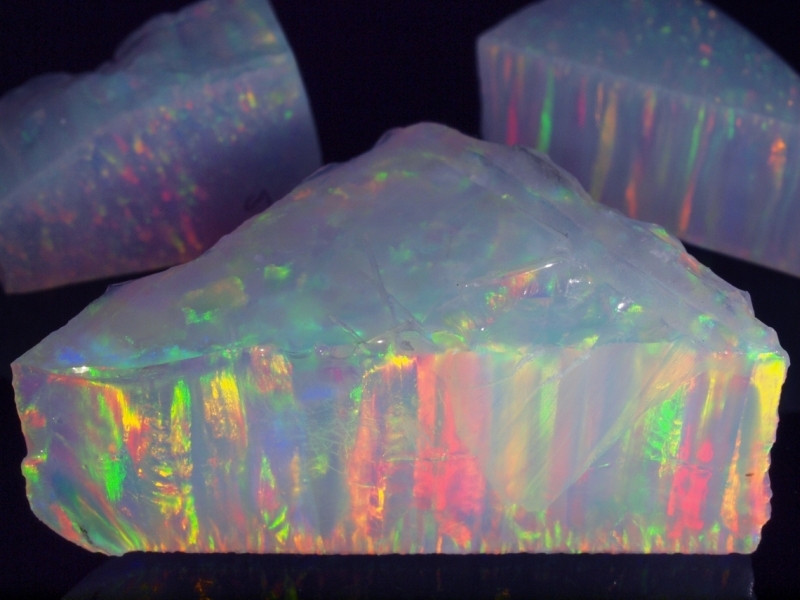 Furthermore, the size of the opals allows carving of big objects and sulptures, massive opal rings and bangles. 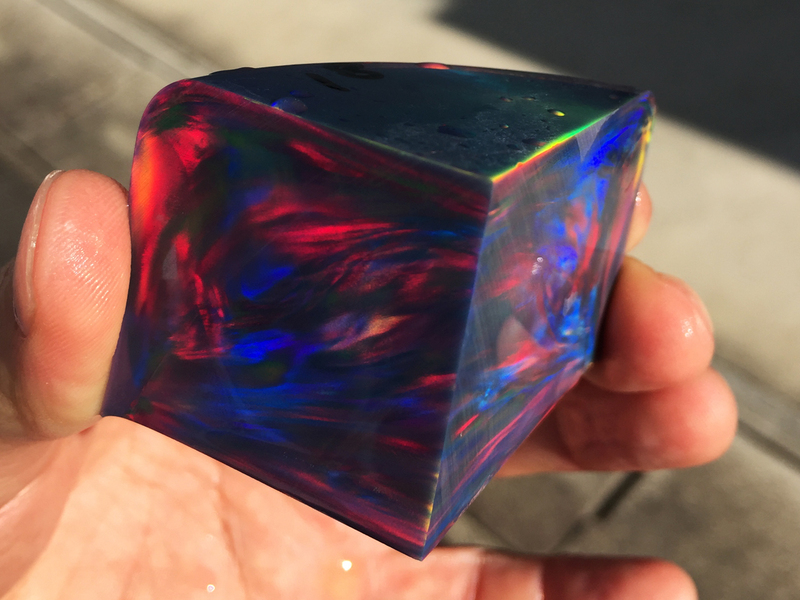 These translucent synthetic impregnated opals show an intense play-of-color with an directional (columnar) pattern without any cracks, inclusions or host rock (matrix). 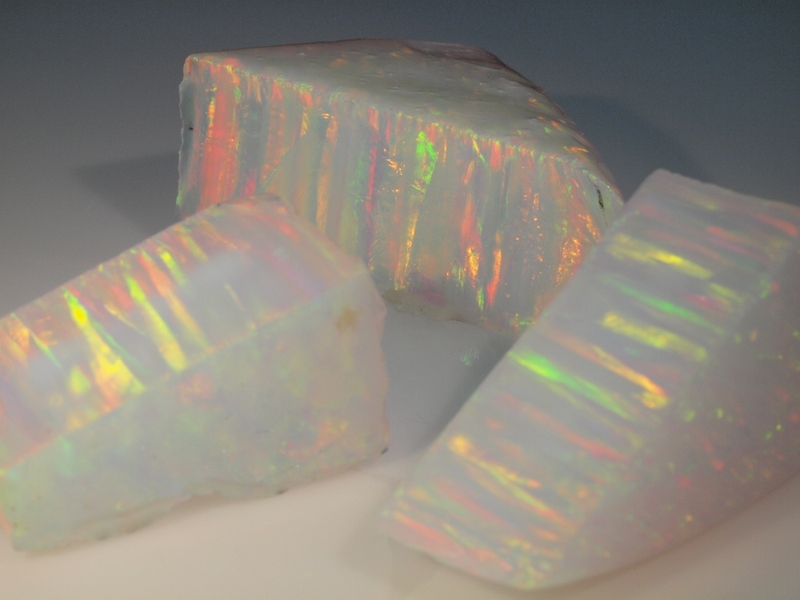 The white opals are composed of self-organized and close-packed monodisperse silica particles embedded in an organic polymer matrix and due to the lack of water in its chemical composition they are not prone to cracking or crazing. 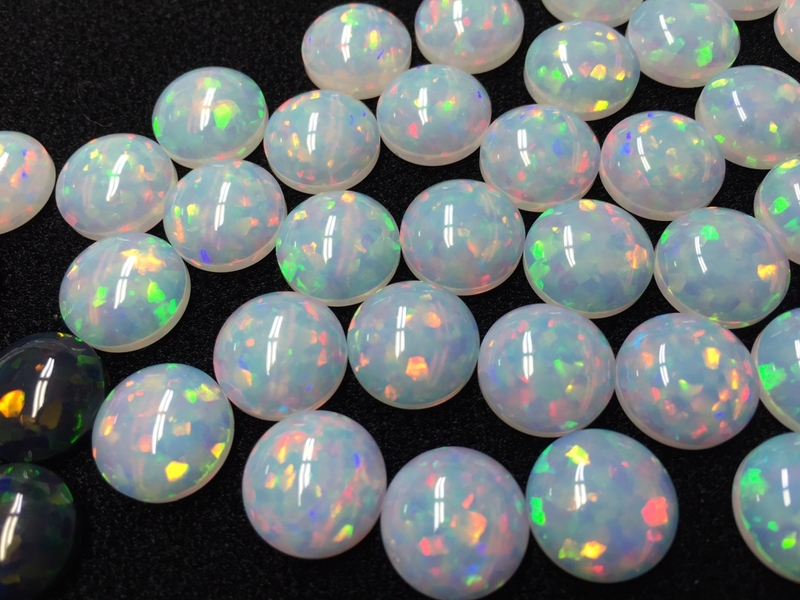 White impregnated opals are available with a multicolored pattern in a variety of weights and sizes, ranging from 50 - 800 grams.